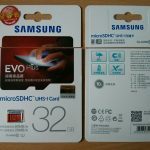 My recent post on how to change the CID on a Samsung Evo Plus SD card has generated some interest, but also a number of people who are having problems with it. I thought it was worth posting an update with some extra information. First off, I suspect some people who are struggling have fake cards – there are a lot out there and some of them look pretty convincing. Others have suggested different hardware / firmware revisions might be an issue – quite possible but I have no way of knowing (all my Evo Plus cards work, so I can’t can’t compare against ones that don’t). I can see no reason why different phones etc. would give different results – as long as it’s a proper SD controller (not a USB mass storage adapter) then sending the command should work just fine. Packaging quality – the image should be well printed, in high resolution and good bit depth on the colours (some fakes looks like they’ve been converted down to 256 colours). The gloss overlay over the printed areas should align with the printing below them, if it’s offset that’s a bad sign. Packaging info – the product information should be correct and match the card. I had one fake that incorrectly stated a 32gb card was SDXC on the pack instead of SDHC, the card itself had SDHC printed on it. The correct size should also be printed on the packet. Look up the UPC from the barcode on the back and make sure that matches the product and size of your card. Hologram, with scratch-to-reveal verification code. The real ones have them (recent ones at least), fakes might but probably don’t. All of mine have, but oddly enough when I tried to check one on the Samsung China website I didn’t get anywhere with the verification code, the site was in Chinese though so I might have been doing something wrong. The card – lots of subtle details to check. Smooth back, not lumpy showing circuit parts beneath the surface. Black on the back, white on the edges. Slight bevel on the contact side, to help insertion. Correct info printed on the card. Correct font, especially for the capacity digits, some fakes don’t use the correct slim font. Text on the back is printed so it is read with the card contacts end pointing upward. Mine are made in the Philippines but this is probably not the only place so don’t get hung up on this. An example of the CID on one of my cards: 1b 534d 3030303030 10 98625deb 0102 a1. Your card CID should be very similar. The manufacturer ID should be 1b, followed by an application/OEM ID of 534d. The product name is 3030303030 (5 x ASCII ‘0’). The product revision is 10 (1.0). The next 8 hex characters (98625deb) are the SD card serial number, yours will be different! The manufacturing date is next (0102, or 0 10 2), where the first digit is ignored, the next pair is the year in hex since 2000 and the last digit is the month in hex. So this is February (2) 2016 (2000 + 0x10). I also have March 2016 (0103) cards that work fine. Last is the checksum (a1) which will be different on your card. I doubt many of the fakes have properly set Samsung CIDs so hopefully this is an easy way to tell. Samsung Evo Plus 32gb. UPC: 8806086928410. Model: MB-MC32D. Model code: MB-MC32D/CN. Purchased from this listing on AliExpress. I am not affiliated with the seller and get no referral commission from this link. I also cannot guarantee that you’ll get working or even genuine cards, but I have purchased on two occasions from this seller and the cards have been genuine and worked with evoplus_cid. I have used evoplus_cid on a Samsung Galaxy Tab 2 (10 inch, wifi model, p5110). The tablet is running CyanogenMod 13 unofficial from here. I’ve made a couple of updates to evoplus_cid. If you supply a full 32 digit CID (and don’t apply a serial number modifier) it will be written as is without recalculation of the checksum. This was requested by a user for cards that apparently always had a checksum of 00. Although, I’ve got a laptop that always displays 00 for the checksum when showing the CID, so I wonder now if his cards really did need that! I’ve fixed a bug when compiling on 64bit Linux that could prevent the CID being written. I’ve also fixed a bug causing the displayed CID to include some extra ‘FF’s. I managed to sucessfully change the CID on an old Transcend 4GB Class 6 SDHC manufactured 10/2013, so it could be that other Transcend cards manufactured around that time might also work. Thanks for your efforts Richard! Good tip, thanks. They must be using a Samsung controller I guess. Marcello did you annotated the original cid of the card you wrote and eventually you would share it? In your article, you wrote that 0x1b is the Manufacturer ID for Samsung SD cards. I am trying to identify the manufacturer of a couple of suspected fake SD cards I own. I have not been successful in finding such a list on the Internet. Maybe you can lead me to such a list. 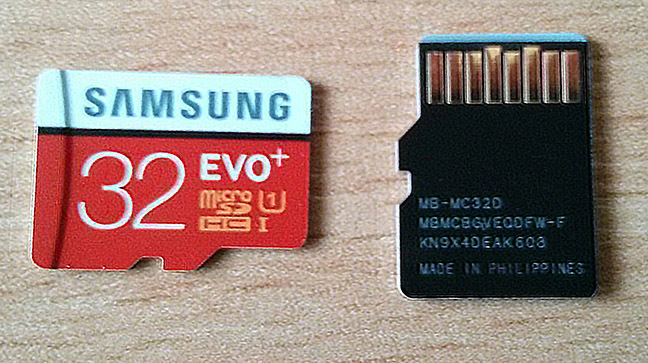 With original Samsung EVO SD Cards, is the + sign in contrast to a written Plus on the card an indication if the CID Change procedure works or not? EAN code: 8806086928656, which is I think a good indication for a working card. The only thing that bothers me is that on the card itself the Plus is in writing and not the + sign. Don’t know I’m afraid, not heard anyone mention this difference between cards and if it works or not. I think you’ll be lucky to find one that still works now though. Dear Richard, some great work here. In raspberry PI : desktop:/usr/local/src/evoplus_cid/jni# ./evoplus_cid /dev/mmcblk0 5d5342303030384712750a9e2f0117bf Writing new CID: 5d5342303030384712750a9e2f0117bf Success! Remove and reinsert SD card to check new CID . However cid keeps always the initial one. In SM-T561, Galaxy Tab E, when try to execute ./evoplus_cid.c get ./evoplus_cid.c: syntax error: ‘(‘ unexpected. And when try to gcc evoplus_cid.c -o evoplus_cid android says already compiled. Also read about some mmc32 and mmc64 that I believe is another code to do the job. But can’t find it. Trying to run ./evoplus_cid.c is trying to execute the source code, so that won’t work. Github already contains the compiled binary, so you can just run that from the libs/armabi folder on Android. I expect that will just work on a Tab E, though not really familiar with the model, but works fine on a Tab 2. Don’t forget to run it as root. Thanks Richard. I’m noob but I suspected that, so was trying to compile evoplus_cid.c in android with CppDroid 🙂 without success. But no one explain that simple thing anywhere “the compiled binary file to android is libs/armabi folder. So now everybody who reads this will Know. My card is mmc1:59b4. So I believe it wont works anyway. Read this somewhere “if you have an entry with eg. “mmc0: 59b4″, you can stop or test another microSD card” . However I will keep trying just because. In tabE, when mount, or df only see dev/block/vold/179:129 not “/ dev / mmcblk * . Do you believe TabE is incompatible? Sorry poor English. Thanks again for trying to teach us. Everything working now in Tab E also. However get the same results that in raspberry Pi III. Writing new CID: 5d5342303030384712750a9e2f0117bf Success! Remove and reinsert SD card to check new CID . Tried 32GB Evo+ from aliexpress, cant change cid, error message is can not to enter vendor mode. 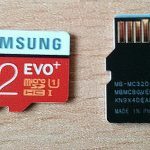 Chi conosce la procedura per riscrivere cid sd card con un cellulare Android? I bought a 100 % genuine EVO Plus 64gb from Korea. ( I made the necessary write/ read speed tests, and the test that detemines the real capacity. Everything seems to be fine with the card). I know that your trick works mostly with the earlier made cards (earlier than ~2017), and my card was manufactured in Nov 2017, but I want to make sure, that I didn’t make anything wrong during the porcess. Failed to enter vendor mode. Genuine Samsung Evo Plus? May it be that there is something wrong with the SD card reader, or it’s more likely that the card is not suitable for the action? Is there any other way to try it on a smartphone, or can you recommend me a place where I can find a card, that probably wil work? I promised my firend to help him in this issue, because he is 38% disabled, but he has to travel a lot with his parents! My best guess from what you’ve said about the different device name is that your linux distro/kernel is quite old, in which case it may or may not be expected to work. Or, the sd card reader might not be a connected by the right bus, it might be a usb one instead (I’m not sure how these show up). 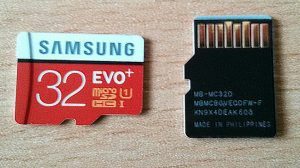 I’d try another device, ideally an android phone/tablet – they will almost certainly have the right type of sd card reader. Thanks for the fast repsonse! I assume, that device should be rooted. Is the procedure identical to the PC one? It will need to be rooted. Procedure is basically the same. More details on the original post, linked at the top. You’ll need to copy the executable to /data or similar, you can’t run it from /sdcard (internal or external) because it’s mounted with noexec permission. someone tried with termux ??? and with android dmontato du virtualbox it could work ???? I would try with termux but my device xiaomi redmi4 pro has architecture aarch64 not yet fully supported,. but according to me the biggest problem and the compatibility of the card. someoneo has a secure seller’s link with compatible cards ?? on aliexpress there sono migliaia, but how do you make sure that they will send the right product? Hello Richard, Can you say please, if i have a chinease card where cid didnt writen yet, i mean they dont have cid yet, all i need to write cid on it, its init the card then turn to transfer mode then cmd26 in SD MODE? then 16byte to data pin? WIll it do th thing? no, probably in that way it will not work. That could also depend if the CID field is completely empty or if there are numbers inside, something like 00000000000000000000000000000000h. as no current Samsung SD card is found to have CID change enabled, what about Swissbit industrial SD cards? I found one seller of navi maps using this products, with ability to update to every future maps change. But no more info, nor I found a way the Swissbit enable users to change CID numbers – their web pages are offering to download tools or apps to work with their cards. It’s against the specification for the cid to be writeable. There is a command in the specification for writing it, but this is obviously intended to be single use only, during manufacturing. While there may well be a backdoor in many sd cards, allowing them the cid to be rewritten by some method, this must be undocumented or the card doesn’t meet the spec (technically having the capability at all, even if it is hidden, means it doesn’t meet the spec, but no one would know). Anyway, my point is it’s unlikely that any branded cards are known to be exploitable (Samsung is the only one I know that has been and they fixed that pretty quickly) and certainly they aren’t going to put the tools to do it on their public website. If there are tools available the easiest way to get one might be to buy the card you mentioned. On the other hand they might just have a key gen for the nav system and send you a key file/code for your card for an update, not actually modify the cid at all. Let me know if you find any more out. I think the best bet is cheap cards from China. You can buy them from ali with any cid set from lots of sellers. I assume that these can be easily set with some dodgy Chinese software if you can find it (a bit like all the tools you can get for fiddling with the controllers on usb memory sticks). I hope you can help me Where can i find the complete description to change cid in android There was a guy in the Netherlands that write it on a forum but i don’t understand en even stock on a point gcc evoplus_cid.c -o evoplus_cid Can you help me please ?? Instruction are in the original post, see link at the top. It’s available pre-compiled on github, so you don’t need gcc. Wenth through all of internet because my navigation sd card started “dying” – throws card errors and sometimes did not even show up in pc. I managet to get an image of the card and also, got card info on my linux laptop, since this image did not work in my car. On Linux laptop I get different last bit of CID than i see in TomTom home software. Since I cannot change CID (did not find any Samsung card that would work the way I need) I decided to order 3 cards from China (seller was king enough to accept compromise of MOQ) and give seller CID to program to these cards. I will have 3 spare cards and no stress of loosing a card or dying card. The problem ir – which CID I should give the seller? I am not a good programmer – just a sysadmin with a cheap french car and I did not wish to purchase new card from Renault for 260€. Anyone has experience with correctness of laptop card readers and CID? The last two hex digits are the checksum. The correct checksum for your card is 05 (as displayed by Tomtom). I have seen some old Linux kernels always report a checksum of 00, but not seen it report 01 before. I wrote a full CID (with a checksum 00), but read two different CIDs on different kernels/HW. Android, ARM32, kernel 3.10.49: Checksum 00. PC, AMD64, kernel 4.10.0: Checksum 01. It doesn’t actually affect anything, and the result is the same whether I write from my PC or Android. This is purely a read issue. It’s no possible to force a specific CRC since it depend on the whole previous 15 bytes being it the CRC7 polynomial of them. By writing/rewriting the CID on the card the sixteenth byte, the CRC, doesn’t matter, since the result only depend on the previous 15 bytes, them are that do the CID. The microprocessor contained in the controller inside the card is the only responsible for calculating the CRC7 based on the 15 bytes which precede, nothing and no one can force that value unless the controller firmware has been specially rewritten. Some have it, some don’t, so in order to read the actual whole CID, CRC included, it’s better acces the card via SPI using appropriate devices, not Android nor Linux. A charitable soul could sell me or just lend me a working SD card ? I try 10 more SD cards from differents vendors on amazon but thay are too recent. I think that the backdoor is locked ! Maybe you could help me with a link to buy a good one ? 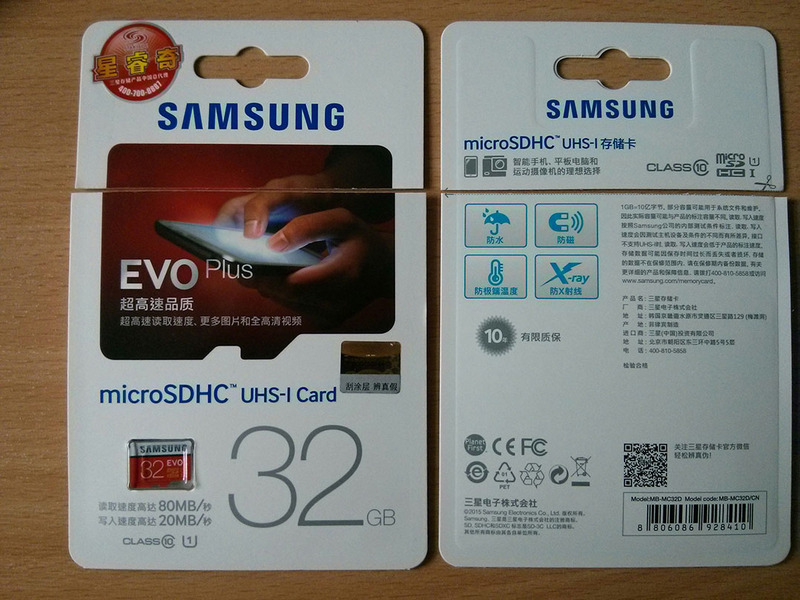 Ordered a memory card of 32 gigabytes on aliexpress here https://ru.aliexpress.com/item/SAMSUNG-EVO-Memory-Card-32G-64G-128G-SDHC-SDXC-TF80M-Grade-Micro-SD-Class-10-Micro/32634349789.html. Come! MMS it 0001, but the CID fails to change. Another 3 people have the same problem. So there is no longer order. Can’t run evoplus at the phone – point /dev/block/mmcblk1 is, but evoplus writes that cannot open the device. All rights of this. What could be the problem? Yesterday i bought a 32GB Samsung EVO+ (12/2016) and it doesn´t work on my Android-Phone(HTC M8 rooted). Then I remembered that i own a Raspberry with an older Samsung 16GB SDHC Pro (MB-MGAGB) and i tried this Card – voila it worked perfectly. Maybe older Class 10 Samsung Cards will work too and we do not have to look for the EVO+ Cards only. Thanks for the great work Richard and greetings from Germany !!!! That’s great news, thanks for the info. Just my experience. I bought this http://www.ebay.de/itm/SAMSUNG-microSDHC-Card-PRO-16GB-Class10-UHS-I-MB-MGAGB-EU-NEU-EU-Shop-004-170-/231987160994 MB-MGAGB, and although program exited with “Sucess!” CID was not changed. I tried on ASUS Zenbook and Raspberry pi2. 2. If i repeat command then unlock command failed. 3. repeat again then Failed to enter vendor mode. Genuine Samsung Evo Plus? despite your card is for sure a genuine one manufactured in November 2016 by Samsung, it doesn’t mean it does accepts the backdoor. As also Richard wrote seems that newer cards don’t work, Samsung has probably changed (or removed) the code that allow them to be unlocked. You have to try another one, better if not so recent. As your reference I have 32GB Samsung EVO+ 04/2016, 32GB Samsung EVO+ 09/2016 and 16GB Samsung uSDHC 04/2013, on all of them evoplus_cid works correctly. Is there any chance to change CID without integrated card reader? I have only desktop and phone without card reader. Yes, in theory, but it will require a “real” SD card reader rather than USB attached one. I’ve only ever seen USB ones in desktop computers, so chances are for the majority of desktops (i.e. almost certainly the one you have) there won’t be any way to do it. I see… Well, I’ll try to resurrect my old laptop and will hope it will run long enought 😀 Btw card reades connected via PCIe won’t work also? What do you think? Depends how they are connected, if they show up as a proper sd controller or as usb, both are possible. My old laptop seems to be realy dead, so I tried to google little bit. I found some sort of solution by using arduino with card reader shield, but there is no implementation yet. So I decided to give it a try and code something. Now i can obtain CID from the card (just not sure if it is correct – hex to int conversion etc). Now the hard part… Can you help me with it? I need to know witch CMDs (+param) I should use. If I succeed, I’ll post the code for everyone of course. Despite Richard surely knows the code he wrote it’s weird that he has failed using the Arduino. The only reason I can think of is that the operation should be carried out in SD mode, don’t in normal 2-wires/4-wires SPI protocol. For what I know the SD protocol is not released to the public, you have to pay royalties to use it legally, so even if you could get some working code for Arduino you may not publish or share it easily. In my opinion a simple way to settle the issue it could be to analyze the data bus with a logic analyzer. Simply you need the right Samsung card and a computer where evoplus_cid works properly, clip the logic analyzer and acquire the data bus meanwhile it is running. May be that you need a pretty fast logic analyzer and anyway it’s not said that you can easily replicate the acquired sequence using the Arduino. Hi. Or5, can you send me contact for you? I m trying to change the CID on my evo + 64gb version. It says that it is changed but when I checked it after unmount im getting my old CID back. Is there someting that I did wrong? I’ve had reports that newer card don’t work, probably Samsung have changed (or removed) the code that allow the cards to be unlocked. I have the same problem and ordered now the third sd card from different countries . I am trying yo change cid in a Samsung Evo + 64gb, I am a neubi in Linux and Android, could anyone describe the process in Android?, how to run evoplus_cid in a rooted phone. If I use a terminal emulator over miui or the terminal of cyanogen the SD is showed as /dev/sdd1 if I use TWRPs terminal the SD is correct /dev/block/mmcblk1 but evoplus_cid does not run, always the same error evoplus_cid:not found. Which app do I need? Just because I found the tie to android interesting I thought I would try this on a 64G EVO+ card i got for xmas for a gopro. Anyway, it comes up as a 59b4 and you can not change the CID. Its manufacture date is Nov 2016 and for what its worth its a model MB-MC64D Model Code: MB-MC64DA/APC. Some one above said 64GB cards always work. Guess this is not the case. Cheers. After running the program I get a Segmentation fault, and tablet hangs. After reboot, cid is not changed. How can I fix this problem? This does not prevent the utility from working… But maybe this causes the problem?? It’s probably writing it fine. Some kernel version never display the correct checksum, they just display 00. Try the card in something else and see what it shows, like an android phone (they almost always do display the checksum correctly). Does it show 00 for other cards as well? I can think of no reason that the card would have successfully taken the rest of the CID but not the checksum. in my opinion what Richard wrote it’s correct. I have some Android devices as well some Linux computers which fail to read CRC even considernig that it’s composed by 8bit of which the last one have to be always 1. As already stated the last bit in CRC byte wrote MSB first is always “1”, “00” is due some misreading of the real one. In fact at least one bit, the LSB, is always “1” so the CRC can’t be “00”! As Richard said by changing the card’s cid using evoplus_cid what will be written is exactly what you input regardless, so doesn’t matter if then the device read it wrong. In order to be sure of the true cid it’s better to directly access the card via SPI rather than use Android or Linux, unless the device you are using for sure can retrieve the cid of the card in the right way. The cid you wrote like input for evoplus_cid is exactly the same you have in the card, unless there has been some mistake, but in that case the program itself would have warned the user. For the 15 bytes 5d53424c32424d31013917ca530104h cid you wrote the correct CRC is 59h, it can’t be 00h! I’ve verified by re-calculating and ultimately it is 59h undoubtedly, in no way it can be wrong! So totally it can’t be “00”, it’s 59h for sure! I’m always getting readed checksum minus 1 compared to recalculated checksum. Lets say I’m entering cid without checksum, evoplus_cid says it’s writing new cid and I can see that program recalculated checksum is right (same as I can see in SD card duplicator, lets say it is “A1”), but after reading back new cid I’m getting “A0” … Where is the problem ? the CRC calculated by evoplus_cid is definitely right, no way. In my opinion the problem you have is only due the way hardware retrieve the CRC. In order to be sure to get the right one it’s better acces the card directly via SPI, not via computer’s hardware, not even if PCI bus based. Richard’s software surely does the job in the correct way, doesn’t matter the CRC you can read via PC’s hardware. If you send only 30 caracters (15bytes) evoplus_cid will calculate the correct CRC by itself. Please, though, explains better what you mean by “SD card duplicator” and exactly how you retrieve the CRC. If you want write here the new cid you intend to use and I will calculate for you its correct CRC, just to ensure that there are no other problems. I take back my guenuine Samsung Evo+ 32 Go to the shop and i take a Samsung Evo+ 64 Go…..and now, the writing process was sucessful. I will try on the RNS315 soon. I think that effectively the backdoor on some Samsung Evo+ 32 Go is closed by the manufacturer. Another thing, yous must format the Samsung Evo+ 64 Go in FAT32 and i do that with a MacBook Air because you cannot do that with Windows. Windows have just two possibilities, NTFS or ExtFat wich is not recognised by UBUNTu. Just for the one’s who wonder. I got a 128 gb microsd evoplus made in Korea, and it doesnt work! I know that the 64GB version is stated as always work, the 128GB one isn’t listed so. My two EVO+32GB are made in Philippines. Instead my Samsung 16GB is made in Korea. All three the cards work like a charm. What could be the reason of this error be? Is the CID invalid? And if so why? Best guess – the error is in parsing the parameter. Have you copied and issued the cid and picked up a bad character which you are then passing as a parameter to the tool? If that’s not it try stepping through the source code and see where the error is occurring. Instead of writing the last two digits as 00 it writes them as 01, this is the CRC right? How can I make this work? Should I write the CID with 30 digits and leave the last two off, and it will automatically calculate the correct last two ones? surely you can try so, I guess it will work fine. In my opinion that is only due the way hardware retrieve the CRC. Since you wrote /mmc prog_cid /dev/mmcblk0 I wonder what tool it is and where take it. sadly your card doesn’t allow for cmd62 0xEFAC62EC that it’s used to switch vendor mode for the backdoor. That ‘s what i guess. Card bought in Poland can not work also I have this. Card purchased on aliexpress works without a problem. your uSD answer “Success! remove and re-insert card to check CID” but the CID has not changed because it allows for cmd62 but doesn’t for the specific backdoor. Anyone knows how to clone serial number pendrive ?. Have already found pendrive and software that allows you to change the serial number of the device. Today I got the card. CID clones correctly. My program does not work on the cloned card. It worked. It was necessary to format the card. actually the two cards you are cloning are pretty different. Maybe you need to change also some parameters on the csd side. Even something in some other register can be different. Try to use an hex-editor in order to verify if blank sectors are 00h or FFh because some cards wipe to 00h and others to FFh. Maybe we could start a little db of cards that do and dont work. I got a feb 2015 16gb plus with 1:59b4 . I havent tested it yet because I dont have the card yet I want to clone. Should I remove all data before I try this? I did note the original CID but I dont know if there is a risk for dataloss. my evo plus 32Gb purchased from ebay is a mmc1:59b4 version not the mmc1:0001 and i couldn’t change the CID. I got the message “Success! remove and re-insert card to check CID” but the CID has not changed. Do all your working cards show as mmc1:0001 ? Yes, all mine are 0001. Also mine are 0001 but this time I don’t agree with Richard because some cards recognized as 59b4 are working the same like 0001’s and their cid can be changed in the same way. In most cases the 0001 always work (not only “evo+” type), but also among 59b4 (not only “evo+” type) there are some that work the same way. It doesn’t matter really, though the cards that are working not only allow for cmd62 but also for the specific backdoor. Your card answer “Success! remove and re-insert card to check CID” but the CID has not changed because it allows for cmd62 but doesn’t for the specific backdoor. This could mean the end of our fun soon. Do you know the manufacture date of your card or can you provide its cid? the crc in the cid you’ve got is indeed wrong, it can’t be “00”. The real one is b5h, so the whole real cid is 1b534d3030303030100a8d55cc0107b5, don’t 1b534d3030303030100a8d55cc010700. Ok for manufacture date as July 2016. My two cards are of April 2016 and April 2013. May be your isn’t the good one, may be they have fixed the issue even if I don’t think so. More simply that’s not the lucky card, you need a substitute for. I know 64evo+ always work, you could try one of them. Would be great to find a standard card (not HC) that works. My Galaxy S5 running cyanagen seems to always display the last 2 digits as 00 and not the true CRC. How do i calculate my true CRC? If i use evoplus_cid to write the CID with the correct CRC digits. Will it actually write it to the new card even though it will still probably show at 00 when i read it? simon666 – leave off the checksum (last 2 digits) when using evoplus_cid and it will calculate the correct checksum for you. It will set it fine (as long as you have one of the cards that works at all!) but it will still read back as 00 on that device. Thanks for the tip Richard. In the end i realised i had an old Lenovo tablet. So i installed SD tools and this managed to read the last two digits of my cards. I executed evoplus_cid and successfully changed the CID of my 64gb card to match. Richard has already answered you, it’s be possible by using his evoplus_cid. As already said the crc for the cid you wrote is wrong, it can’t be “00”. The real one is b5h, so the whole real cid is 0353445355303247801d7db62900ccB5, don’t 0353445355303247801d7db62900cc00. You need to solve the CRC7 polynomial of the 15 bytes of the cid for getting it. I tried to to change the CID and it worked for changing the first 30 numbers, but for the last ones I wanted them to be 00, and the code printed that they were going to be changed to 00 but when I read the CID they were changed to e9. I used the Samsung Evo Plus 32 GB, it seems to be the same model as yours. I compiled your code and ran it in a raspberry pi running the latest raspbian. Do you know what could it be? What command did you run? And are you sure you need the last 2 digits as 00? This is technically invalid. Although a user requested this before I later came to suspect that his original card probably did have the right checksum – some versions of Linux seems to always show the checksum as 00 when displaying it. If you can, is it correct? I compiled the code with the raspberry using: gcc -o evoplus_cid evoplus_cid.c It gave me some warnings, and then ran the program with: sudo ./evoplus_cid /dev/mmcblk0 then the 32 digits of the new CID. The program then printed the CID as I entered it and said successful write. Can you confirm you can change the checksum of your card to 00? as already stated the last bit in CRC byte wrote MSB first is always “1”, “00” is due some misreading of the real one: due the fact that at least one bit, the LSB, is always “1” the CRC can’t be “00”. Anyway I can confirm that despite what could show the device you are using for, the cid you wrote like input for evoplus_cid is exactly the same you have in the card, unless there has been some mistake, but in that case the program itself would have warned the user. By default CRC isn’t active in SPI mode unless it’s forced on by CMD59. In order to be sure of the real content of the cid the better way is to acces the card via SPI. I can confirm his statements. Anyway by changing the card’s cid using evoplus_cid what will be wrote is exactly what you input regardless, so doesn’t matter if then the device read it wrong. In order to be sure of the true cid it’s better to directly access the card via SPI rather than use Android or Linux, unless the device you are using for surely can retrieve the cid of the card in the right way. Could be that raspberry can’t read the true cid of the card. Which raspberry model are you using? Due raspberry has a single microsd card slot, are you sure it’s safe change the cid directly on the OS mass memory storage? Im not sure it is safe to change the CID in the OS storage, but currently I don’t have anything else to try, maybe I’ll try with another device when I can get one. I used the first Raspberry B model. Can you confirm you can change the checksum of your card to 00? Thank you both for the support. In my opinion thats could not be so safe, though. For me isn’t somebody can change the CRC from “00” to another value, it’s that the real one can’t be “00”. Anyway I confirm that despite what you can then read from the device you are using for, the cid that you input in evoplus_cid is exactly the same that you have inserted, doesn’t matter what you are seeing which it’s depending from the hardware you are using. In order to be sure of the true value of the cid the better way is to access the card via SPI. due the fact with ecoplus cid you are changing a cid that isn’t otp hard coded but that is located in memory, there is some possibility that is even possible write its CRC as “00” even if that is a nonsense. If you want write here the 15 bytes of the cid you are talking about and I will calculate its true CRC as 16th byte in order to compare it with that you have got. For me it works on 32GB Samsung EVO+ 04/2016 and 16GB Samsung uSDHC 04/2013. I wonder if it can be successfully used on not HC cards (size below 4GB). I believe with Samsung’s 2GB cards marked using blu screenprinted capacity it could work, though I have to find that kind of card. Thank you for the sharing! in my opinion that cards allow for CMD62 but manufacturer porpouse for them is different or their cid backdoor set is so. When I try change CID of these 16 and 32 GB cards, evoplus_cid return success, but CID is not changed. Thank you for the info, it should help other people when choosing their cards.